Description: A major release of a major forgotten symphony with absolutely top-class notes and at mid-price! This is the best thing Naxos has put out in years. This symphony was one of the commisssioned works for the 2600th anniversary of the founding of the Empire of Japan (Britten’s Sinfonia da requiem was rejected by the Japanese for being anti-war, leaving Richard Strauss’ Japanische Festmusik, Ibert’s Ouverture de fête and Sandor Veress’ Symphony - Hungarian Greetings as the other three performed in Tokyo in December of 1940). The Japanese must have thought they’d get a particulary celebratory work from a composer lauded by the Fascist regime in Italy but this powerful and unsettling work, 43 minutes in four movements, is notable for its ominous mood, its compositional progress between February and June 1940 mirroring the unfolding European conflict and Italy's own declaration of war. One wonders what they made of it. By the way, the original performance from Dec. 19, 1940 by the “Centenary Celebration Symphony Orchestra” of 170 players, conducted by Gaetano Comelli, can be heard on YouTube. The 21-minute harp concerto is from 1958-60 and is sunny, lyrical and vivacious. 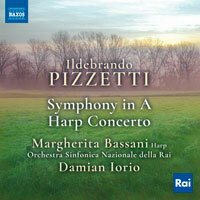 Margherita Bassani (harp), Orchestra Sinfonica Nazionale della Rai; Damian Iorio.